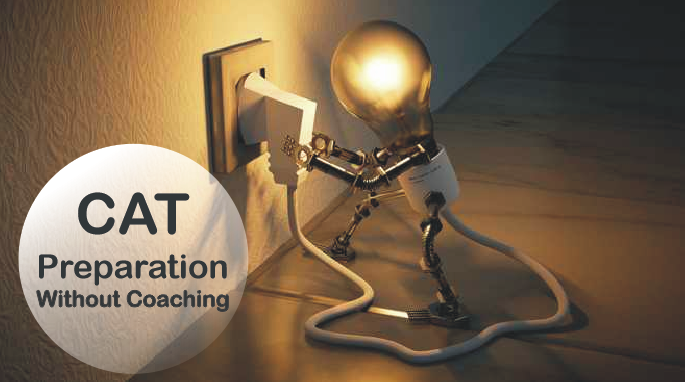 While preparing for CAT without coaching may be a good idea, it may not be a good decision if you are preparing for CAT for the first time. I will divide this article into four different sections. The first would be who should prepare for CAT without coaching. The second would be why should you prepare for CAT without coaching. The third would be why not to prepare for CAT without coaching. The fourth would be how to prepare for CAT without coaching. Here, by coaching, I mean without any full-time classroom involvement, offline or online. Of course, you may buy a few test series, or may even purchase or enrol for a few online courses. But since you do not commit yourself full time to these, I would not count them as coaching inputs. Having mentored more than 3000 students over a span of seven years, I can say that CAT is not a difficult exam. Yes, it is indeed a competitive exam, and you should be good enough to be there right up in the top one percentile of students to stand some chance of getting a seat in your dream college. It would be wise for students who have already gone through one round of full-time classroom preparation, to not waste money in expensive classroom programs. Such students should not be in the habit of seeking personal assistance. While personal assistance may aid learning, it is often a big barrier to self-learning. I would suggest that such students should lay out a preparation plan that matches their schedule and other constraints. Moreover, students who are wise and smart enough to use free resources should never join any full time coaching program. There is so much of free content available that if that content is put to good use, it would more than do the job. But the students must have a good sense of what is relevant to their preparation and what is not. Why should you prepare for CAT without coaching? CAT coaching has become very expensive. Regardless of the city that you are in, the cost of CAT coaching could be anywhere from 35000 to 70000. If you add the conveyance and the opportunity cost to it, then it is a huge investment. In addition to this, if we consider the amount and number of online resources that we have these days as a replacement for classroom content, then it indeed makes sense to avoid expensive coaching. CAT coaching for the second time in a row is not effective. CAT institutes do not update their content every year. So if you enrol for a full-time program again, you are likely to learn the same thing, from the same people, in the same way, something that is not likely to add much value. How to prepare for CAT without coaching? You should access the right free resources. You can read this article on free cat study material (we will have an article on free cat study material). Most of the resources available here are relevant to CAT. You should know how to use these free resources. The drawback with free resources is that you have to depend on your own judgement about whether it is good or bad, required or not required. Sometimes, you may unnecessarily focus on the areas that are less important, or sometimes you may ignore those that are more relevant. You should join a few WhatsApp groups and Facebook groups. It is good to study in groups, but joining too many of the same type of groups may distract you from your goal. The idea is to keep yourself updated about prep and to be in touch with those who are preparing for the same exam. Being on too many groups at the same does more harm than good. Though I have said that joining full-time coaching is not required if you have already gone through one cycle of cat classroom coaching, you should not refrain from addressing your weak areas by enrolling for online courses. Such courses will help you overcome your weaknesses and address them in the right way. Finally, you must join at least two test series. You should start with the sectional tests only after you have covered all the basics and have developed the skill to solve questions of varying difficulty. The purpose of sectional tests and mock tests is not to improve the basics but to develop the right balance between speed and accuracy. If you follow the above steps, you should be able to prepare for CAT without any coaching. After so much of discussion on why to prepare for CAT without coaching, let’s discuss a little on why CAT preparation without coaching may not be a good idea. You need personalized mentoring and motivation regularly to keep you on track.